1. Stir-fry the chicken in a non-stick frying pan or wok with 4 sprays of oil for 4-5 minutes. Add the ginger and cook for a further 3-4 minutes until the chicken is golden. Add the lemon juice, soy sauce and spinach. 2. 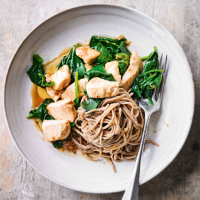 Gently cook until the spinach has wilted, the chicken is thoroughly cooked with no pink meat. Season. This recipe was first published in Thu Jun 01 10:01:00 BST 2017.